UPDATE: Post-sentencing statement of Nikos Maziotis. On March 3rd 2016, the Koridallos prison court sentenced all co-accused in the second trial against Revolutionary Struggle with regard to the attack with a car bomb containing 75kg of explosives against the Bank of Greece’s Supervision Directorate in central Athens on April 10th 2014; the shootout in Monastiraki on July 16th 2014 (when comrade Nikos Maziotis was injured and recaptured by police); and expropriations of bank branches. 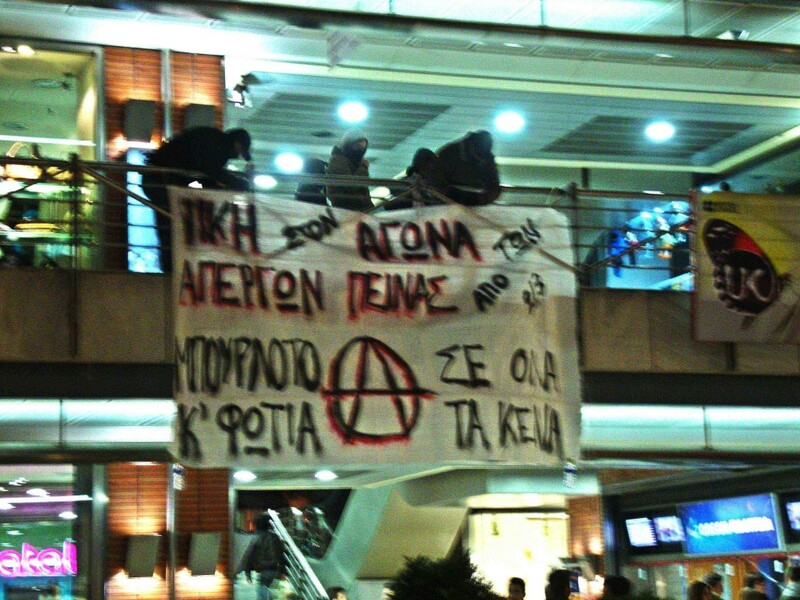 Revolutionary Struggle member Nikos Maziotis was sentenced to life in prison plus 129 years and a fine of 20,000 euros. Revolutionary Struggle (fugitive) member Pola Roupa was sentenced to 11 years in prison on misdemeanor charges (if arrested, she will stand trial on felony charges, too). Antonis Stamboulos was sentenced to 13 years in prison. Giorgos Petrakakos was sentenced to 36 years in prison plus a fine of 9,000 euros. Over the last days an anti-terrorist media spectacle is unfolding in Greece. Police released a statement about an incident of attempted helicopter hijack on 21 February; a woman using a fake ID card and apparently with the description of Pola Roupa, clandestine member of R.O. – Revolutionary Struggle attempted to hijack a helicopter departing from Thebes with a pistol. The woman had booked a flight to pick up 5 people at a pre-arranged route, but caused the pilot at gunpoint to change direction towards Attica. At one point, the pilot fought back, being an ex-policeman, who claimed to have recognised Roupa through media photographs. He tried to take the pistol, leading to a struggle which ended in the helicopter being brought down with two bullet holes in the windshield and one in the instrument panel. The woman then escaped and so far has not been captured. Police recovered a pistol mag, headphones and a wig which were sent for forensic analysis. The police believe that this was an attempt to spring imprisoned member of Revolutionary Struggle, Nikos Maziotis, from Korydallos Prison, and they also speak as well of anarchist comrade Antonis Stamboulos, bank robber Giorgos Petrakakos and “at least 2 to 3 members” of R.O. – Conspiracy of Cells of Fire who are suspected of participating. The police now attempt to reconstruct the “synchronisation” of the imprisoned comrades and locate the woman who made the defeated hijacking operation. Maziotis is held in the isolation dungeon which is the basement of the Woman’s Section of Korydallos, where members of R.O. – November 17 and R.O. – Conspiracy of Cells of Fire are also held. Searches by the security forces took place in all parts of the isolation basement yesterday night revealing absolutely nothing. In a climate of tension, a new trial for Nikos Maziotis unfolded in the specially designed court in the female prison wing of Korydallos. He is now being accused for acts allegedly committed during the period that he was wanted by police. His co-defendants are his fugitive companion, Pola Roupa, the anarchist A. Stamboulou who is denying the charges, and the recently arrested G. Petrakakos. The defendants are charged with, among other things, the offenses of membership and participation in a terrorist organization of which the leader is claimed to be Maziotis, an accusation of exploding a car bomb at the Bank of Greece on Amerikis Street in April 2014, for which Maziotis has taken political responsibility, and also for supply and possession of explosives, explosions, and two robberies. Moreover, Nikos Maziotis is accused of attempted homicide in the shoot-out with policemen in Monastiraki in the summer of 2014 when he was arrested. And when asked by the court to speak in his defense, the accused read a text-manifesto with harsh words against the political system and the judges. “Those who live on 300 or 400 euros a month are not terrorised by Revolutionary Struggle, but by you and your regime,” he said addressing the judges. Nikos Maziotis declared himself an “anarchist prisoner of war”. He described the trial as political, claiming it was a title of honor for him to be armed. G. Petrakakos, in turn, denied the charges and reserved the right not to speak in his own defense. The tone went up further when the presiding judge announced that the court sessions would start at noon and will last until the evening as there is a risk of the expiration of 18 months [of pretrial detention time] for the accused Stamboulou. The legal advocates responded by invoking the “special status” of the trial, accusing the court that it gives priority to the principle of expediency, not of legality. “Make a trial by yourself, your shame stands revealed!”, cried the packed audience. “Arrange when we will come not from Pangrati but from the provinces,” complained witnesses. “We will reach out to the Chief of Appeals, it is humanly impossible to meet,” said the lawyers. Finally, after these reactions, the President interrupted the schedule for the morning of October 19, clarifying however that the other meetings will be held. . . in the afternoon and then proceeded to call out the the names of witnesses, amid loud protests. Antonis Stamboulos (32 years) in Larissa prison, Anastasios Theofilou (32 years) and Nikos Maziotis (44 years) detainees in the prison of Domokos and wing E1 prison Domokos (Type ‘C) respectively, and Dimitris Koufodinas (57 years) and Kostas Gournas (34 years) hospitalized in secure-hospital Lamia, hunger strikers from 03.02.2015 until today. All mentioned hunger strikers are on the 24th hunger strike day in a critical condition with now visible symptoms that they are at risk of destabilization of their bodies that may threaten their health and even their very lives. All strikers have lost 13% -15% of their initial body weight, report feeling weakness, dyspnea, and fatigue on minimal exertion. Exhibiting hypotension, hypoglycemia, hyperuricemia, ketonuria, electrolyte abnormalities and mild mucosal pallor. Considering the clinical picture, the results of laboratory tests and the particular problems of each, (from their personal history) I point out the seriousness of their situation, and I urge the competent institutions to take responsibility of their part immediately, to avoid any negative development . Anarchist Antonis Staboulos has started a hunger and thirst strike because although there was a court order dictating that he should serve his pre-trial detention in Korydallos prison, he was illegally transferred to Larissa prison. This tactic used by the ministry of justice is not an isolated event. It is part of an overall vindictive strategy against those prisoners who are considered dangerous or are accused of being members of armed organizations. It’s the first glimpse of the type C prisons and of the imposed isolation from the prisoner’s family. We stand next to Anarchist Antonis Stamboulos and we warn the ministry that the death of a prisoner caused by a hunger and thirst strike will have consequences that they cannot predict. Let everyone claim his/her responsibilities. Strength to the hunger and thirst striker Antonis Staboulos. Note: Antonis Stamboulos ended his hunger and thirst strike on 11 October. He wrote a statement explaining his decision which is being translated and will circulate soon. On October 1st, the anarchist Antonis Stamboulos is arrested by the counter-terrorist agency accused of terrorist actions. His arrest was hyped from the media, in a furious journalistic climate, based on findings of guilt and imaginary scenarios as signed directly from the 12th floor of the police headquarters. At the same time, under coordinated counter-terrorism investigations in Athens and Thessaloniki, five people were arrested, the two of whom were detained and driven to Korydallos prison, on charges of aggravated possession of weapons and possession of explosives. The arrested Panagiotis Michalakoglou claimed responsibility for the weapons found in his house, while M.B. has nothing to do with the case. Update 11/10/14: Antonis Stamboulos has stopped the hunger-thirst strike today for specific reasons explained in his latest text which is being translated. Media Terror-Frenzy: Greek counter-terrorism police arrested Antonis Stamboulos on 1 October on charges of belonging to the Revolutionary Organisation – Revolutionary Struggle (Epanastatikos Agonas: EA). The police said that Stamboulos’s arrest was likely to prevent terrorist attacks, probably planned for 1-4 October, on several targets mentioned in a notebook allegedly in Stamboulos’s possession. The targets are alleged to include Vangelis Marinakis (a shipowner and the chairman of the Olympiakos football team), Theodoros Fessas (the president of the Federation of Hellenic Industries) and his Athens-based IT firm InfoQuest, the premises of the ruling New Democracy (Néa Dimokratía: ND) party, as well as Capital (a Greece-registered ship management company), and German engineering company Siemens. Following his arrest on the 1st of October 2014, Antonis Stamboulos is currently being held under pretrial detention facing terrorism charges. On October 6th, with another open letter, the comrade announced hunger and thirst strike denouncing the fact that he is now being held in the prisoner transfer centre of Athens. Furthermore, he protests the ongoing media construct fueled by antiterrorism cops against him.